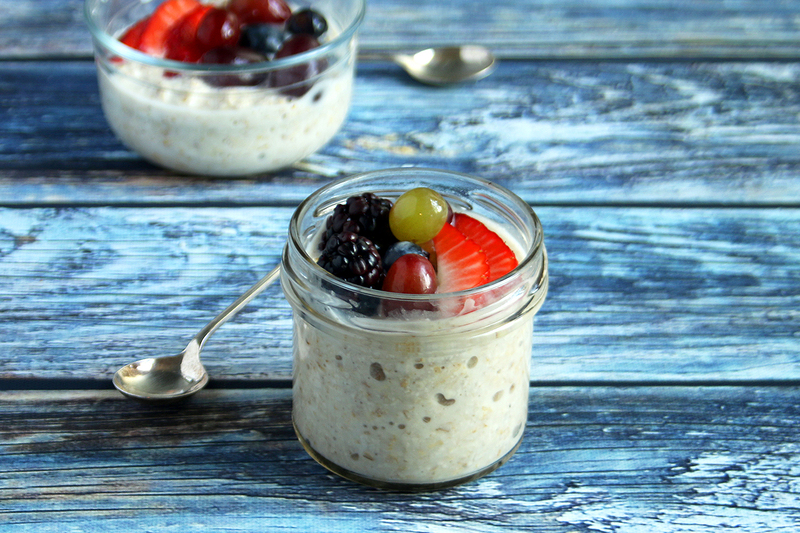 These overnight chia pots are great for mornings when you are in a hurry as you simply pop it in the fridge the night before to soften and swell. 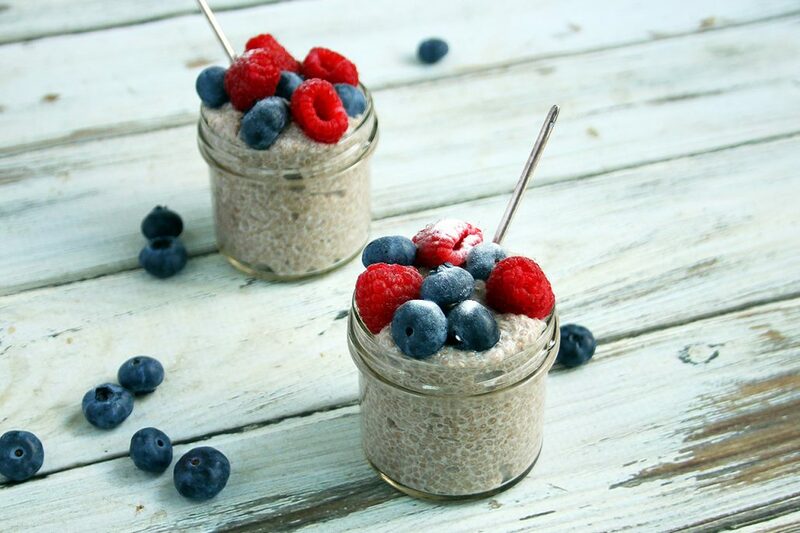 We topped our chia pots with berries, but you could use any fruit, nuts or granola. Another variation could be to add ground cinnamon into the mixture and top with diced apples! Combine the almond milk and chia seeds in a bowl. Cover and place in the fridge for several hours, or preferably overnight to soften and swell. The next morning, simply stir in the vanilla extract and Stevia and divide between 4 pots or small bowls. Top with berries of your choice and an additional sprinkle of Stevia, if desired. 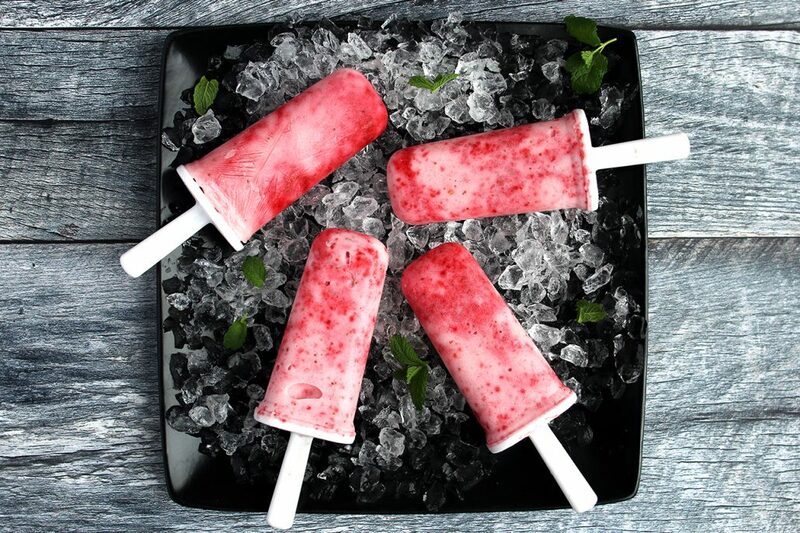 Invest in popsicle / lolly moulds and you will be making these refreshing, guilt-free popsicles all summer long. (Reusable silicon or plastic popsicle/lolly moulds are approximately £9 on Amazon and will be a great investment if you have a sweet tooth. Most are 100ml in size and come in sets of 6). Trim the strawberries and dice into small pieces. Place in a bowl and sprinkle over the fructose, mixing well. Cover and leave to macerate in the fridge overnight. The next morning, blitz the strawberries to a puree and fold in three-quarters of this blitzed puree into the yogurt. Whisk well to combine. Divide the strawberry yogurt between the 100ml lolly moulds*, stopping at intervals to add a little of the remaining blitzed strawberry puree. (This just makes it look pretty by giving it a mottled appearance. You can simply combine all the blitzed puree into the yogurt if that’s easier and quicker for you.) Click the lid/stick in place in each mould, and place upright in the freezer for several hours, preferable overnight. *You are likely to have some leftover mixture after filling the 6 moulds. You can simply place this in a small bowl or ramekin, cover with cling film and freeze along with the others, or leave unfrozen and enjoy as an addition to your breakfast smoothie. A simple, well-balanced lunchtime salad that can be made ahead of time. 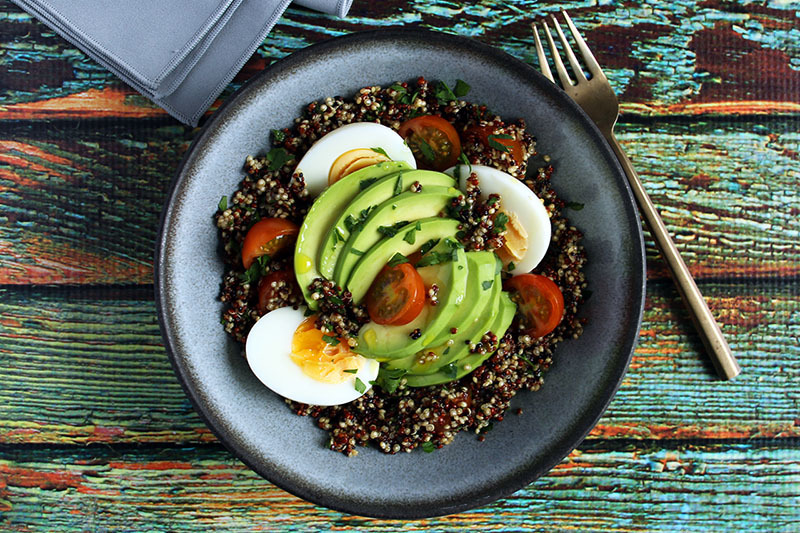 We used ‘mixed seed’ quinoa (red, black and white seeds) which offer an earthier flavour and retains a slight crunch. Use a good quality soy sauce and simply top with all your favourites! Bring 300ml water to the boil and add the mixed seeds quinoa, cooking over a moderate heat until all the water has evaporated. Set aside to cool. In the meantime, boil the eggs to your liking, peel and set aside. Once the quinoa has cooled, stir in the olive oil and the finely chopped mint and parsley. Stir in the soy sauce and divide the mixture between two bowls (or lunchboxes). Place the oats, protein powder, almond milk and vanilla essence into a bowl. Stir well to combine, then cover and place in the fridge overnight. The next morning, sweeten the oats using the sweetener of your choice (or drizzle with honey if you do not like artificial sweeteners) and stir well. Top with fresh berries and enjoy! 1-minute microwave ‘cakes’ have become really popular over the last few years, so we jumped on the bandwagon! This would make an ideal snack for those of you that need something sweet every now and then. We added a tablespoon of wheat bran for extra fibre (available at Holland and Barret and very cost effective) and used only the natural sugars in the mashed banana to keep your macros in check. If you feel this may not be sweet enough, add a little of your favourite artificial sweetener or a drizzle of maple or honey into the mix. 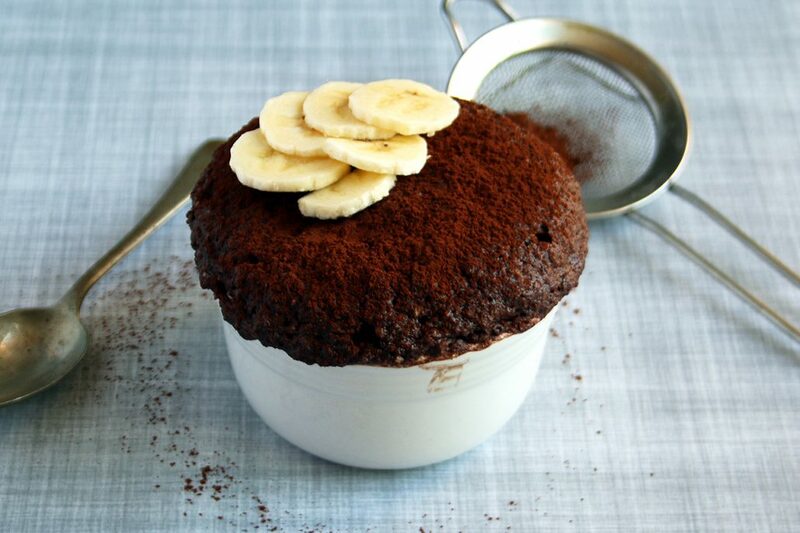 Combine the almond flour, baking powder, wheat bran and cocoa powder in a bowl. In a separate bowl, mash the banana to a smooth puree using the back of a fork (over ripe bananas will mash easier), then add the egg and vanilla essence and whisk well to combine. Remove from the microwave (carefully, it will be hot!) and allow to cool slightly before eating straight from the dish. Alternatively, you can run a spoon around the edges and tip the muffin-looking mini cake out onto a plate. 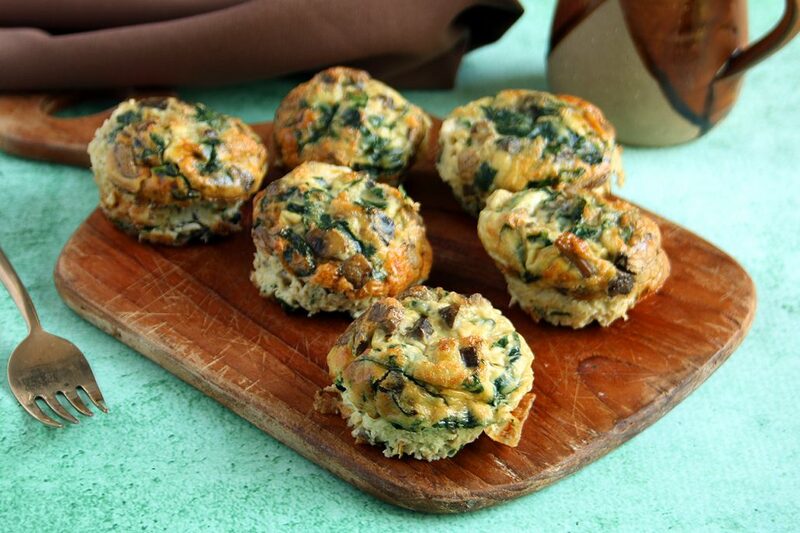 We love these little frittatas! They are fairly quick to make, ideal for those doing keto and very convenient. Make a batch and keep in the fridge for up to 3 days. They only need 30 seconds in the microwave to reheat, so two in the morning and you will be good to go. We added a small amount of reduced fat cream cheese to the mix: if you have any of the flavoured ones on hand (like onion and chives), even better! It’s important to caramelise your mushrooms and wilt the spinach beforehand: it adds massive flavour and reduces unnecessary moisture, so don’t skip that step as tempting as it may be. Heat the olive oil in a large pan and fry the mushrooms until golden and caramelised. Add the finely sliced spinach and allow it to wilt. Lower the heat and cook until all moisture has cooked out. Season with salt and freshly ground black pepper. Set aside to cool slightly. In a bowl, whisk the eggs, almond milk and cream cheese until well combined. Tip the cooked vegetables into the whisked eggs and stir well. Season the mixture with salt and white pepper. Grease a muffin tin and use a small ladle (or ¼ size measuring cup) to evenly distribute the mixture into the muffin tin. There will be enough to make 7, and they should be filled 7/8th high. Place in the oven and bake for 15-20 minutes, or until a cake tester inserted into the centre of one comes out clean. Wash the potato (do not peel) and use a sharp knife to pierce several holes into all sides of it. Make a shallow cross incision on the top of the potato, then place the potato in the microwave on high for 5 minutes until completely soft and cooked through. In the meantime, place the cream cheese in a small bowl and season with salt and freshly ground black pepper. Remove and discard the skin from the smoked mackerel and break the fillet up into smaller pieces. Mix half the pieces into the cream cheese, setting the other half aside to top the potato. When the potato is done, push into the sides using your fingers, allowing it to open up at the top (be careful, its hot!). 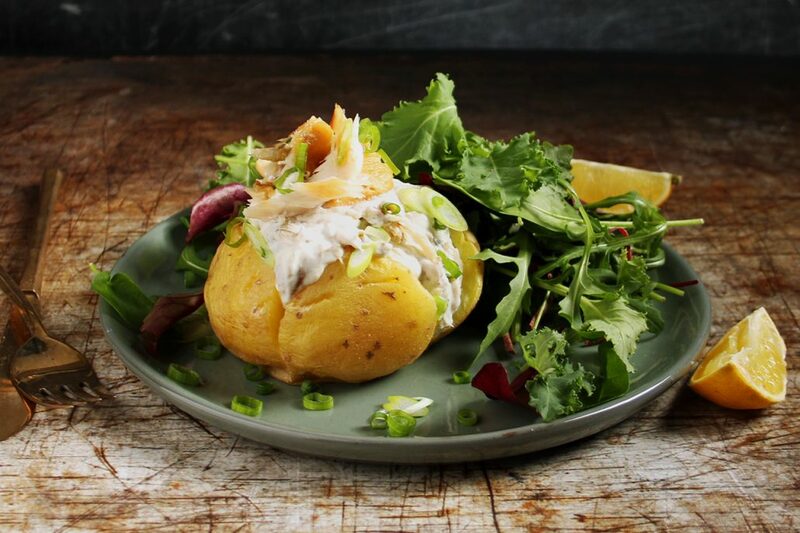 Spoon the cream cheese into the potato and top with the remaining mackerel pieces. Garnish generously with spring onions and serve with mixed salad leaves and a lemon wedge on the side. 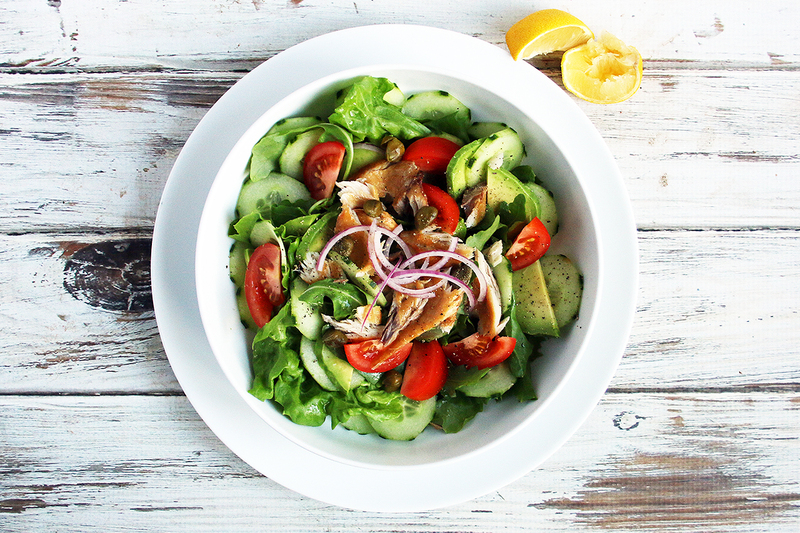 This is a lovely salad using smoked mackerel and capers. The flavours are so dominant and the fish is oily, so you need only a drizzle of olive oil and a squeeze of lemon to dress. Lush! 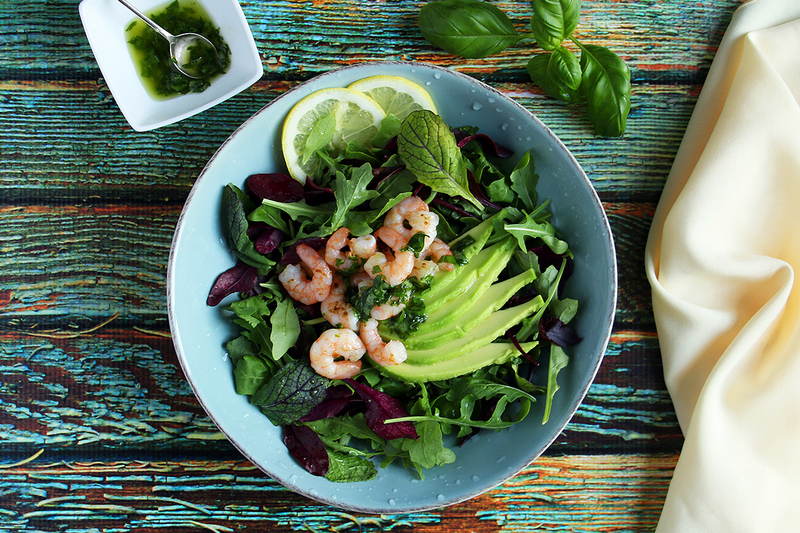 Place all the ingredients in a bowl and drizzle over the olive oil. Season with salt and pepper and toss well to evenly coat, allowing that one teaspoon olive oil to go a long way. Tip into the serving bowl and break over the mackerel. Scatter the capers over the salad and serve with a lemon wedge or two to be generously squeezed over.